The information, insights, and counsel that Blasingame provides are based on decades of his real-world experience, working closely with leaders of all manner of companies, to establish and then sustain rock-solid customer relationships. Over time the essentials of those relationships have changed significantly, posing both unprecedented opportunities and (to be sure) unprecedented perils. In my opinion, several of the most disruptive changes are the result of the emergence of the Web not only as an electronic marketplace but also as a source of almost unlimited information about merchandise for sale. Jeff Bezos’ vision for Amazon is for it to become “The Everything Store.” He and his associates continue to re-invent what is already an immensely successful organization. 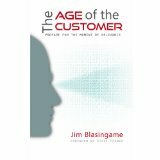 Then in Section II, “The Age of the Customer to Market” (Chapters 9-26), Blasingame correlates as well as develops in much greater depth many of the core insights he provides in the first eight chapters. He focuses on “specific tips and best practices that you can put to work today as you listen to and respond to the new expectations of Customers. You will recognize many of the terms, concepts, and shifts already mentioned, but this time they’ll be associated with applications as you take your business to market, prepare for the Moment of Relevance, and execute your Age of the Customer strategy.” Jim Blasingame would be the first to suggest that attempting to apply all of his suggestions would be a fool’s errand. It remains for each reader to make a rigorous evaluation of the strengths and weaknesses of their organization’s current relationships with customers and then select the material in the book that will be most helpful when strengthening those relationships. This is indeed the Age of the Customer but business leaders would be well-advised to keep in mind comments made years ago by then chairman and CEO of Southwest Airlines, Herb Kelleher. He was asked to explain that company’s extraordinary success. His reply? “We take great care of our people. They take great care of our customers. And our customers then take great care of our shareholders.” With rare exception, that alignment guarantees the success of almost any business. o Develop a cohesive, comprehensive but flexible, and cost-effective “Relevant Moments Action Plan” to achieve that objective. Comment: Leverage the organization’s most significant strengths against its competition’s most significant weaknesses. o Implement with bold, sharply-focused initiatives. Comment: “The Age of the Customer” is a marathon, not a sprint, but the course to be run will frequently change. So, I submit that reading and then re-reading this book can be — and should be — the next best option to having Jim Blasingame involved and engaged, full-time.